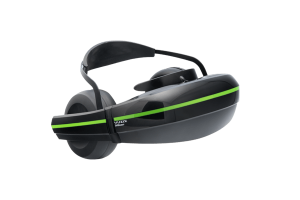 In theory, on paper, and even sometimes in practice, Vizux’s iWear Video Headphones are fantastic – a stereo headset that sports twin 720p displays, 3D and VR support, and a built-in battery? Sign me up. It sounds a little like a better version of Cardboard, right? It sounds like a headset you’d pack in your bag for those on-the-go gaming sessions when you don’t want to be bothered by those around you – on a bus or flight, for example. In practice, though, iWear is slightly…underwhelming. It’s a bit heavy and unwieldy to wear on the head, and as such isn’t quite as mobile friendly as you’d expect. I ran into trouble trying to test iWear on my three different phones; Nexus 6P, OnePlus 3T, and LeEco LeS3 – incidentally, all Type-C USB phones. It worked just fine on my XBox and on my Laptop, though, and as such my testing session consisted of Destiny, Outlast, and Resident Evil 7 on my XBox rather than an Android, as I’d have preferred. Before we get into my personal gripes and wishlist items for iWear, though, let’s dig into what it does well. 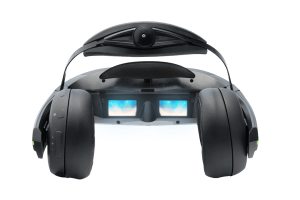 Vuzix’s iWear is a solidly performing device, both audially (made that up) and visually; the 720p resolution of the dual screens is crisp and the colors vibrant, and the audio is rich and deep – what you’d expect from any mid-to-high range headphones. While there’s no Dolby Atmos or Surround support, the actual audio quality is quite good. A slightly more classy look at the headset. Unfortunately, this is a circumstance where the overall product is not quite as good as its parts would suggest. iWear suffers from being too versatile – a Jack of all Trades – and, to complete the cliche, master of none. It would have been much better-suited specialization, finding a niche and marketing to them, rather than trying to reach as broad an audience as possible. In order for the iWear to be worth its $299.95 price tag, it would have to undergo some pretty serious structural hardware changes. First, for mobile devices; while Vuzix advertises the iWear as being compatible with phones and tablets, it’s not exactly…mobile-friendly. The thick, all-in-one cable that’s built-in to the headset is entirely too unwieldy to be used while connected to a phone. Ideally, the headset would be entirely wire-optional, making use of Wireless Direct broadcast the screen rather than HDMI; further, there should have been a USB port on the headset, rather than a built-in cable. Second, for desktop and console gaming; in order to be a true option here, the iWear needs to have a microphone built-in to communicate in online games. Voice chat is a staple in gaming these days, and I personally feel naked without it. At $300, the iWear is a bit steeply priced, but in specific situations, it can be well worth it. In setups where space and audio are at a premium – such as playing late at night or when you don’t want to bother other people – it’s a great option. Purchase Vuzix’s iWear either from Amazon or from Vuzix itself. 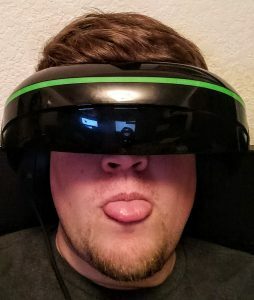 Unfortunately, Vuzix's iWear suffers from being something of a 'Tweener device - it has features that are attractive to both mobile gamers and desktop/console gamers, but not the complete feature set that either requires to justify the purchase. It's too unwieldy and cord-laden for mobile gamers, but not immersive enough and lacking a mic for desktop/console gaming.